Price has a good deal of information on this name: Pronounced Corrig·leitrim. The name of the hill which forms the northern spur of Sorrel Hill. It is quite well known, though it is not on the O. S. map. The old track which crossed the mountains between Douce Mountain and Gravale must have passed close to it... 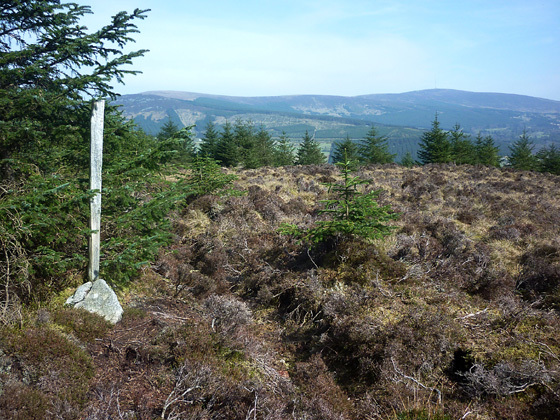 There is a cairn of stones on the hill [PNCW]. He also proposes this place as the identification for Liathdruim, mentioned in the 12th century Metrical Dindshenchas, suggesting it was of some importance. Previously Ballynatona in MV. Carrigleitrim is the 903rd highest place in Ireland. Picture from Harry Goodman : Post marking the top ! of the hill. Picture: Post marking the top ! of the hill.